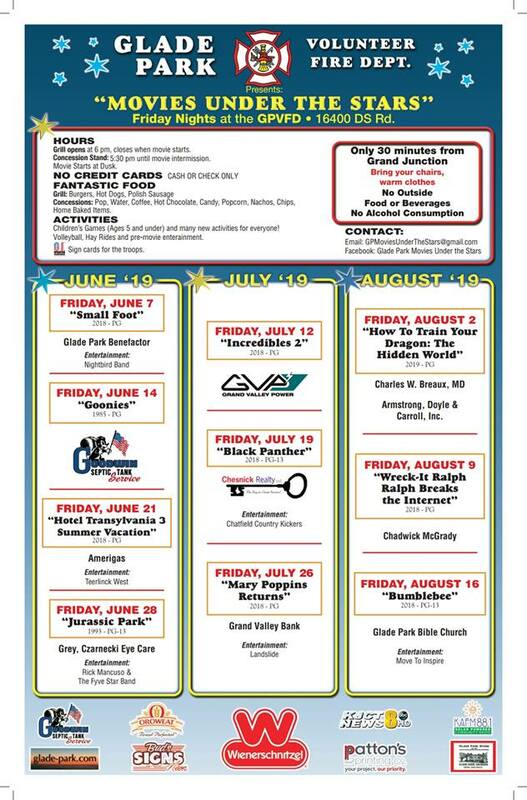 “Movies Under the Stars” is the major fund raiser for the Glade Park Volunteer Fire Department. On summer Fridays, hundreds load up their families and drive up from Grand Junction to cool off and eat at the grill (only open during the movie) and watch a family movie under stars that are bright and plentiful. For locals it is a place to visit with neighbors, and show support for the Fire Department by volunteering to flip burgers and brats at the grill and concession stand. Location & Parking: On DS Rd, proceed west, just past the Glade Park Store. It is no longer necessary to park along the road. It is safer and more convenient to use the new parking lot, which is off the main road just west of the fire department building. Come early and make an evening of it. Till movie time (dusk) there is local entertainment, a hayride, volleyball, food, and drawings for door prizes. Be sure to bring coats, and even a blanket (after dark we have cool mountain air), and lawn chairs. Some even bring sleeping bags for the kids to crawl into when it cools off. Be prepared for a big sunset and then lots of bright stars. Pet Policy: Dogs and cats are allowed,as long as they are on leashes. The owners must be in control, and responsible for any clean up. "Movies Under the Stars" is the main fundraiser for Glade Park Volunteer Fire Department. A sponsorship provides some advertisement and goodwill for your business or cause, and also goes toward vital firefighting and rescue services for the community.